Do you think it is impossible to find a promotional token, which is easily loved by all customers alike? Then probably you haven’t seen this promotional dog shape bottle opener animal keychain. It strikes chords with all pet lovers due to its unique design and offers large value to them as an amusement tool, key holder and bottle opener. This dog shape bottle opener keychain can be employed for driving sales at your veterinary clinic, attracting customers to your pet hospital, bringing together various pet owners, for announcing pet fashion show and many more. 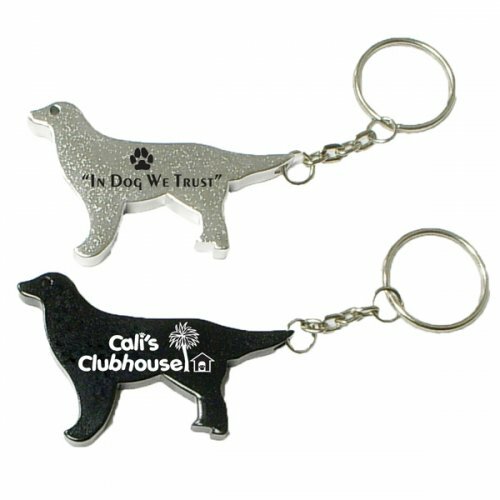 Request a quote to know price benefits that can be availed on wholesale custom dog shape bottle opener animal keychain. Features –Dog shape bottle opener with key ring in metallic finish. Product Size – 2 3/8" x 1 1/2"
Available Colors - Metallic Black & Metallic Silver. Product Size :2 3/8" x 1 1/2"